Mt. 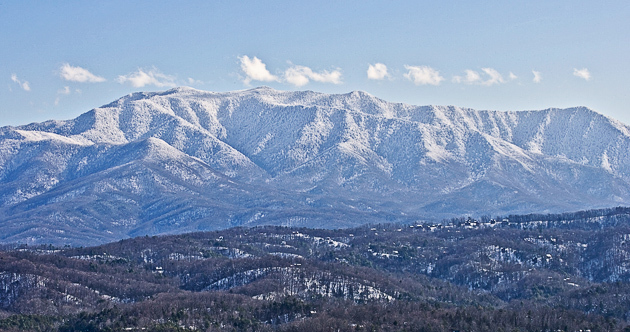 LeConte is the third-highest Smoky Mountains peak, but to me it represents the skyline of the Smokies. As you approach from the north, Mt. 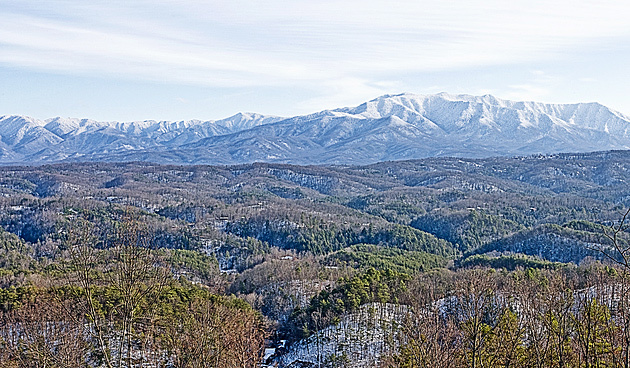 Leconte is a Smoky Mountains landmark seen from 50 miles away, or further on a clear day. As you travel around the Gatlinburg area, there is LeConte, above you in the sky, showing you different views. What is known as the Mt. 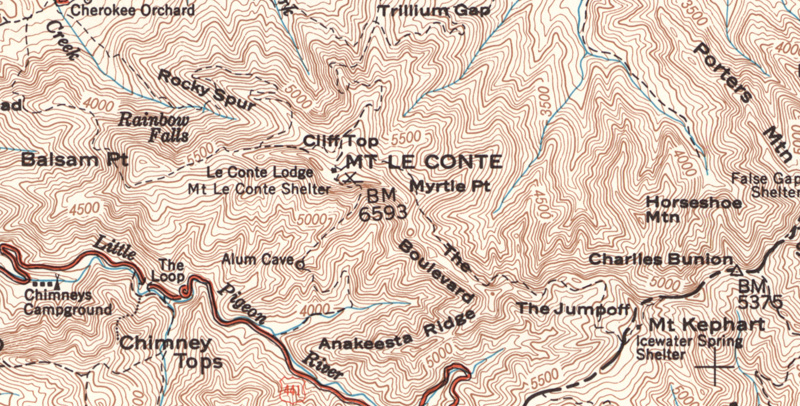 LeConte massif is actually 5 peaks, with four of them over 6000 feet. West Point (6,344 ft), High Top (6,593 ft), Cliff Tops (6,555 ft), Myrtle Point (6,200 ft) and Balsam Point (5,840ft) comprise the majestic Smoky Mountains view that we all know and love. The topo map below from 1949 shows the details of the area. Click on the image to see a larger version. 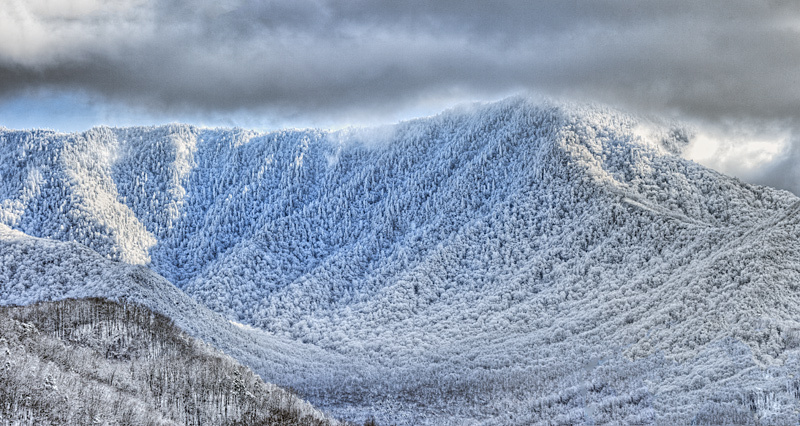 The north side of the mountain rises a full mile from its base to the summit, making it the tallest mountain in Tennessee by that measurement. 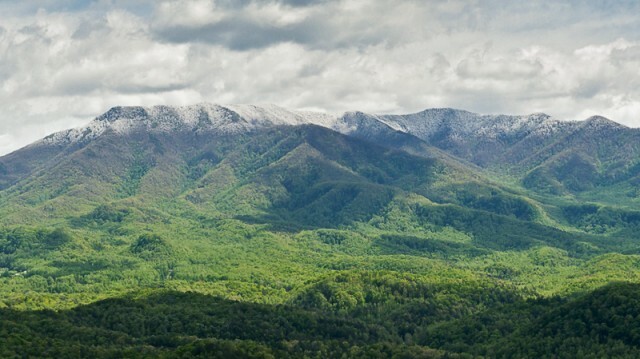 Storms that plow into this massive barrier dump immense amounts of rainfall into the watershed, fostering the diversity of plant-life for which the Smokies are famous, such as the amazing green rocks along the Roaring Fork. 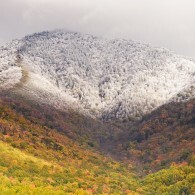 The photo above was taken from high on Shields Mountain, about 10 miles north of the Smoky Mountains. And the photo below was taken from the Campbell Overlook on the Newfound Gap road, looking up to an early snow on Balsam Point. 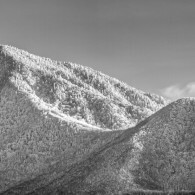 The mile-high mountain also creates a weather phenomenon called “mountain wave winds.” Those of us living on the north side of the slope are familiar with the howling, near-hurricane-force winds that are generated when a storm front passes over Mt. 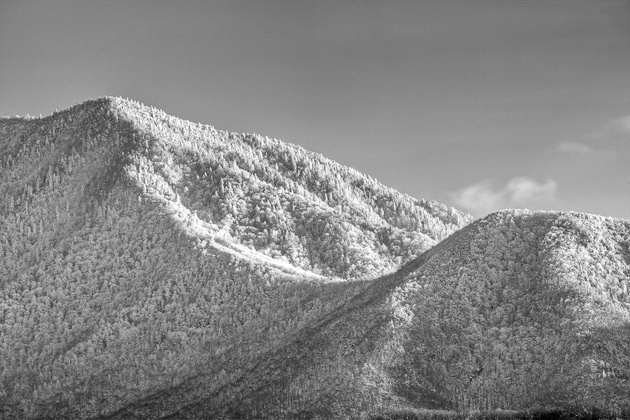 LeConte from the south. The William Britten Gallery of Smoky Mountains pictures is open and ready to welcome you on your next visit to the Smokies. Please stop in and say hello and browse all of my photos. 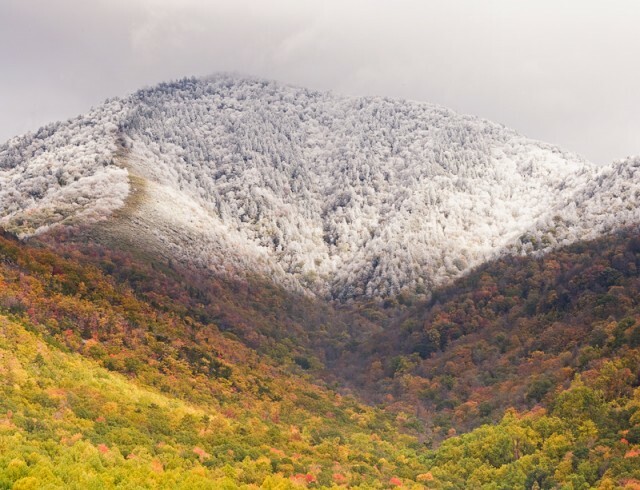 This time of year can be absolutely breathtaking in the Gatlinburg area. 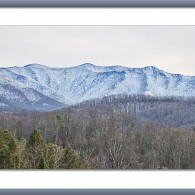 Both of these images show a winter panorama of the Smoky Mountains with Mt. LeConte center stage. They were taken from a ridge way out on Upper Middle Creek Rd. about 10 miles or so from the Smokies. A long telephoto lens was used. Please stop in for a hot cup of coffee or tea and to see the complete display of Smoky Mountain Photography at the William Britten Gallery in Gatlinburg, TN. 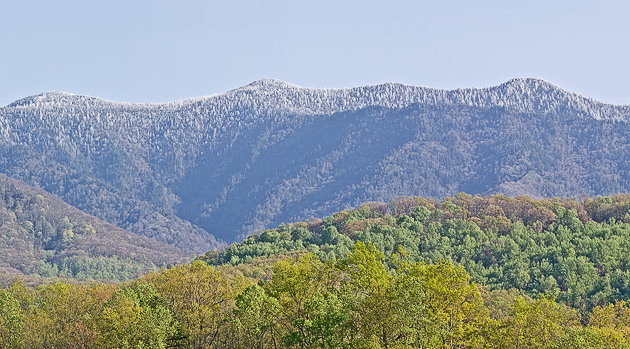 A spring snow dusted Mt. 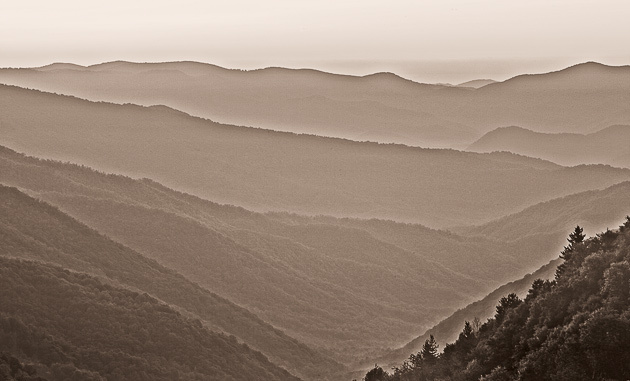 LeConte on Tuesday night, closing the road to Newfound Gap in the Great Smoky Mountains National Park. 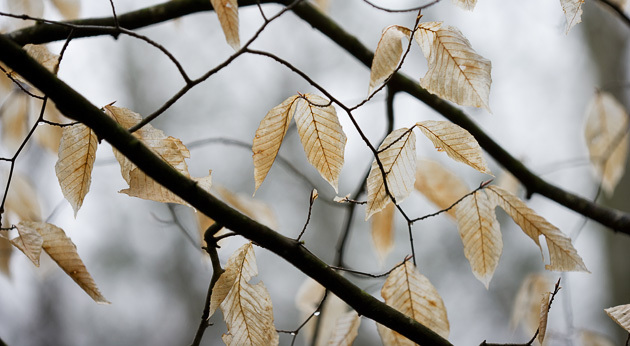 It’s not unusual to see the contrasts of winter and spring in one scene as in the picture above. The summit of Mt. 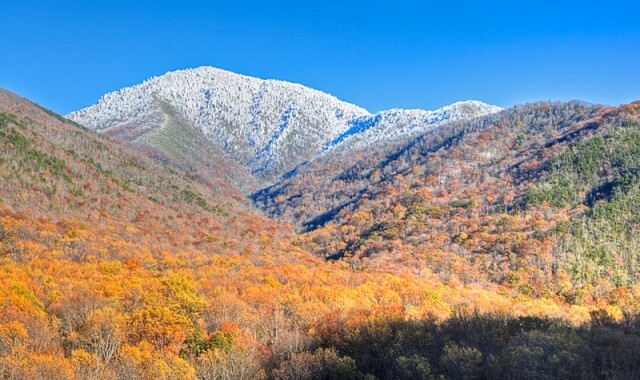 LeConte is around 6500 feet, while the green trees in the foreground are down around 1500 feet. 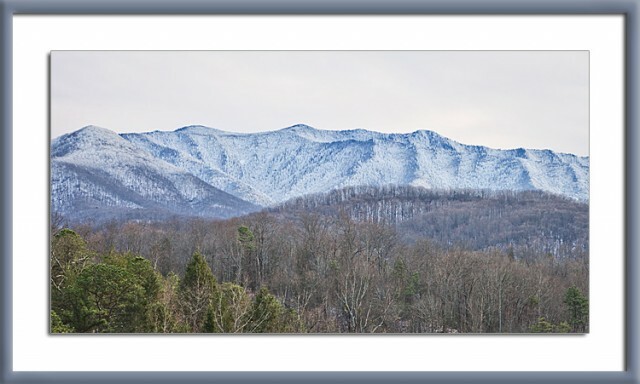 The photo above was taken from the same vantage point near my home in the Glades area of Gatlinburg as Smoky Mountain Moonrise, which shows snow on the summit of Mt. LeConte and fall foliage below. Stop in and visit me at the William Britten Gallery in Gatlinburg, TN. Click on the image above to view a dramatic hi-resolution version. 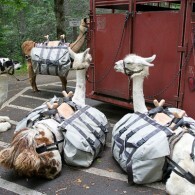 A packtrain of llamas is used to carry bed linens and supplies to Mt. LeConte Lodge. 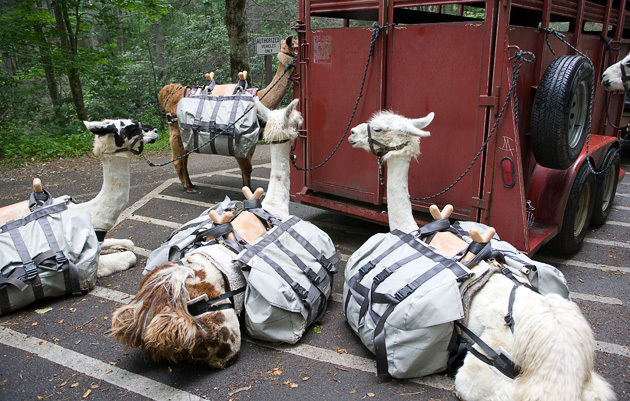 The llamas are easier on the heavily used Great Smoky Mountains National Park trails than horses. 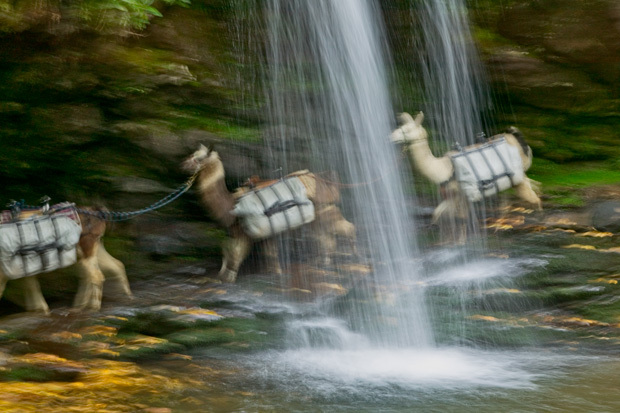 In the picture below the llamas are passing behind Grotto Falls. Normally, the packtrain makes the trip from the Grotto Falls Parking area on the Roaring Fork Motor Trail on Monday, Wednesday, and Friday. Departure is often just around daybreak, and return between 3:00 and 5:00 in the afternoon. 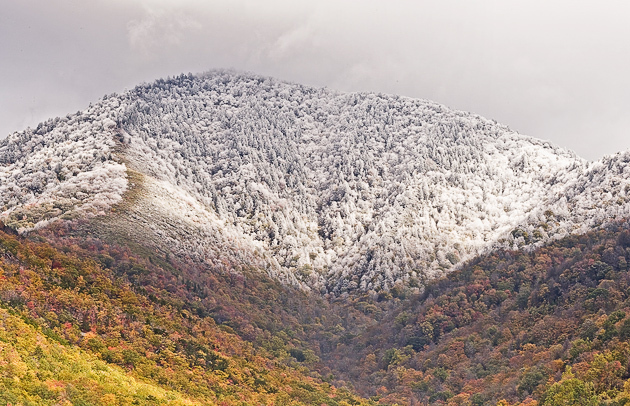 The last week of October 2012, the long arms of Hurricane Sandy produced a Smoky Mountains wonderland of snow in autumn. 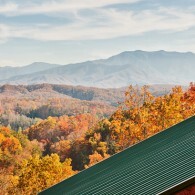 The Smokies offered stunning photos from all the overlooks. 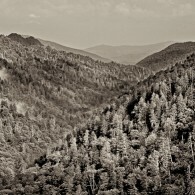 The photo above was taken from the Gatlinburg by-pass, with the Park Vista hotel in the lower left corner, and the Roaring Fork Motor Trail heading up the valley in the center of the picture. 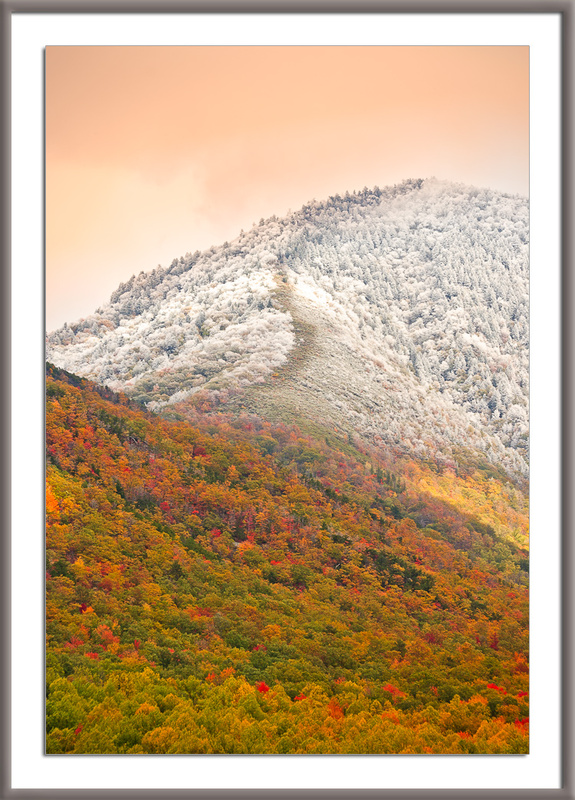 This was the same location that produced some fabulous photos last April of a spring snowfall. 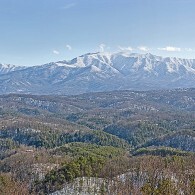 The photo below was taken from Campbell Overlook, showing the western shoulder of Mt. LeConte. Total snowfall in the highest elevations was nearly 3 feet! 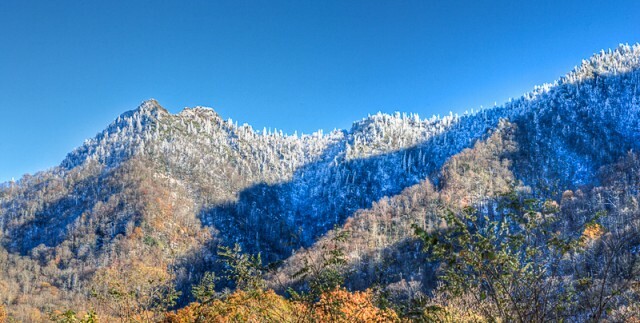 The trail to the Chimneys is a favorite Smoky Mountains hike. In the photos below the Chimneys are the two bumps on the left side. This is a rugged climb under the best of conditions, but snow and ice make it a special challenge. If you are visiting the Smokies, please consider a stop at the William Britten Gallery along the historic Arts and Crafts Trail on Glades Rd. 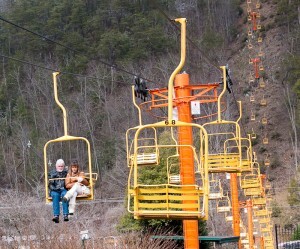 in Gatlinburg. 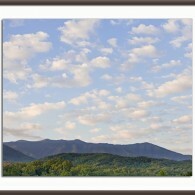 The gallery features Smoky Mountains landscape photos, as well as magnets, mugs, and notecards. 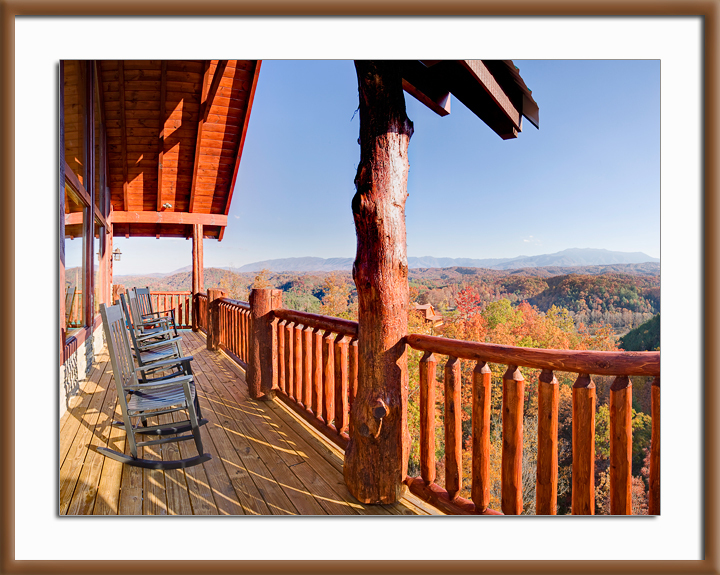 It’s not too late to schedule a Smoky Mountain getaway, find yourself a cabin like this one, and sit back to gaze at Mt. 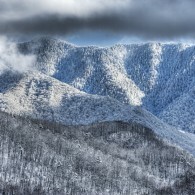 LeConte and count your blessings for the year. The autumn leaves may have faded, but there’s plenty of blue skies and perfect temperatures to enhance your reverie. 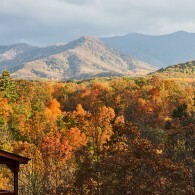 Between now and Thanksgiving is a great time of year here in the Smokies. The October crowds are gone, the trails are dry, and the nights are chilly enough to light up the fireplace. Come on down and visit me to see the complete display of Smoky Mountain Photography at the William Britten Gallery in Gatlinburg, TN. 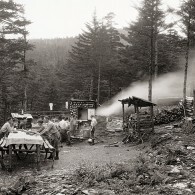 This edition of Smoky Mountains history shows the outdoor kitchen on Mt. 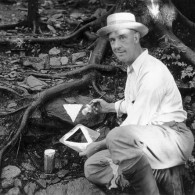 LeConte circa 1925. This kitchen was near the original LeConte Lodge built by Jack Huff. 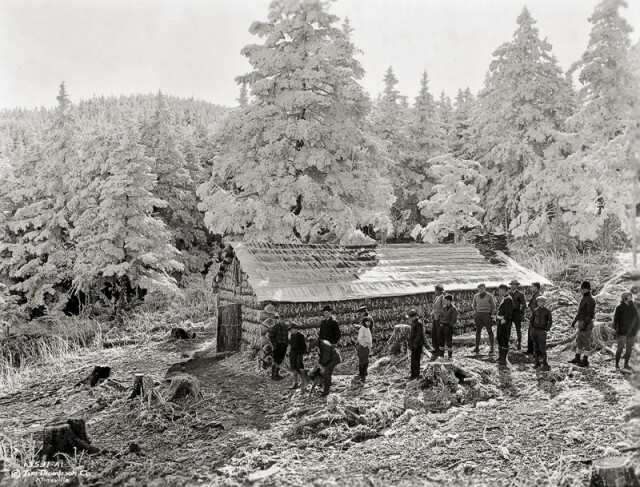 Photos and descriptions of that early lodge can be found in the blog post titled The House That Jack Built. 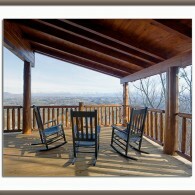 The photo above was taken by Knoxville photographer and businessman, Jim Thompson. This photo is so full of interesting detail that I broke it into the three larger views shown below. 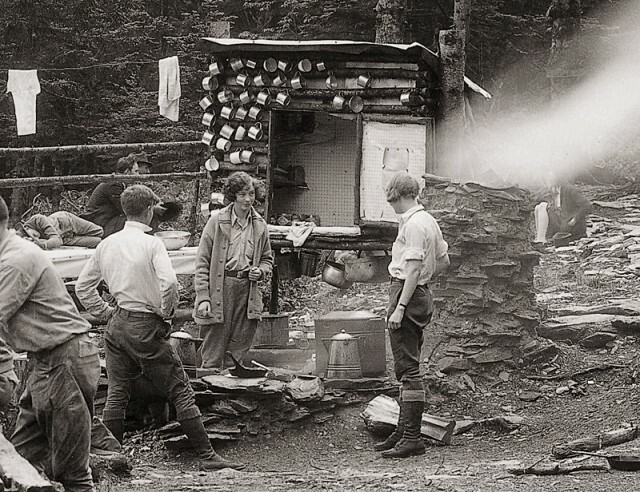 I think it’s a fascinating look at camping in the mid-1920s at what would have been an extremely remote outpost at the time. Above, the men gather around the breakfast table to discuss plans for the day. You can see someone sleeping on a table in the upper right. Below, the women gather around the camp stove. Love those 1920s hair-styles! Finally, the photo below shows the tent, the supply of firewood, and another camper greeting the day. Note the high-top hiking boots worn by all. I bet they’d take forever to get on and off. Historical photographs used with permission of C.M. McClung Historical Collection, Knox County Public Library. Click on any image to see a larger version. 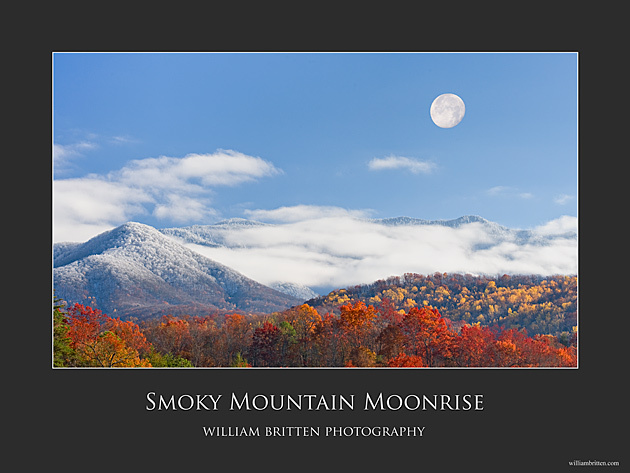 Smoky Mountain Moonrise is a recent addition to the William Britten Gallery. 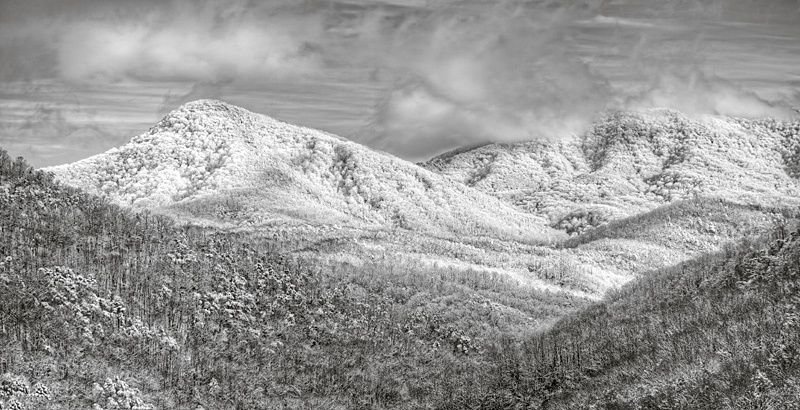 This stunningly beautiful photo was taken east of Gatlinburg in the Glades area. It is actually a location that I pass every day because it is on the street where I live. Many of my photos of Mt. LeConte are taken from this vantage point. This was early November with the fall leaves past their peak in the lower elevations, and completely gone from the higher elevations. 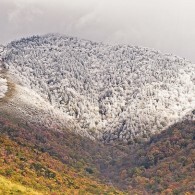 An early snowfall gave just a dusting to the upper parts of Mt. LeConte. It’s late in the afternoon, with the last rays of sunlight striking the mountain, creating a glow on the leaves. Driving home, I saw this image and quickly grabbed the camera and tripod before the light faded. I took several images, and kept waiting for the clouds to clear out. But what appeared at first to be passing clouds was actually condensation, as the sun-warmed air hit the cold, snowy mountain. 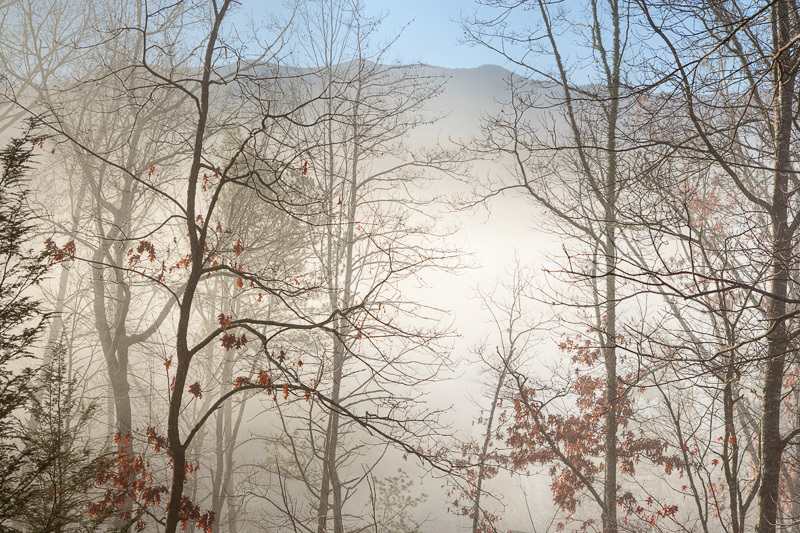 If you’re on a Smokies vacation, please stop in for a visit to see the complete display of Smoky Mountains Photos at the William Britten Gallery along the historic Arts and Crafts Trail on Glades Rd. 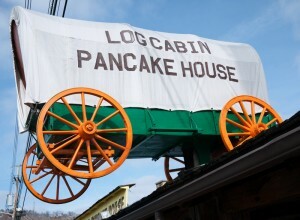 in Gatlinburg, TN. 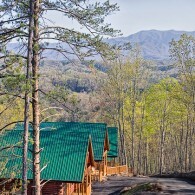 So many resort cabins with a stunning Smoky Mtns view. 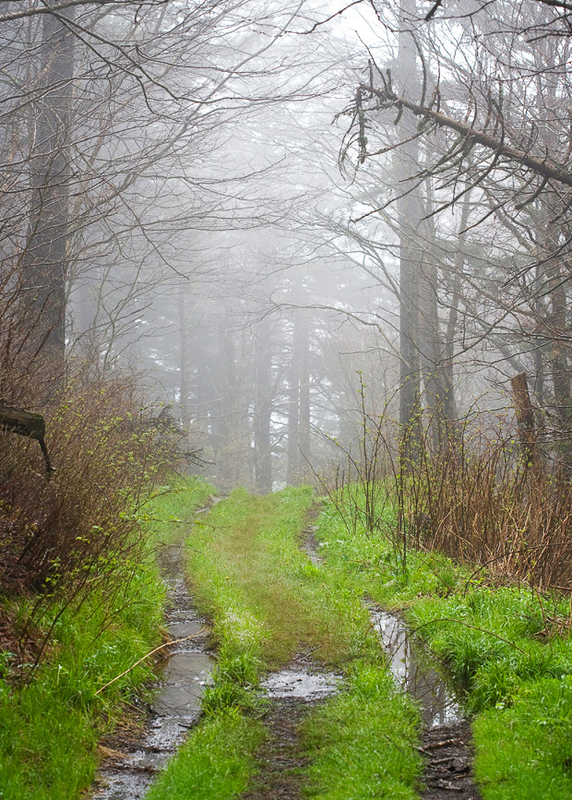 Like stepping into a photo … what a day for a daydream! Custom made. A perfect day for taking a walk outside. On a day such as this your daydream might last right on into the night. 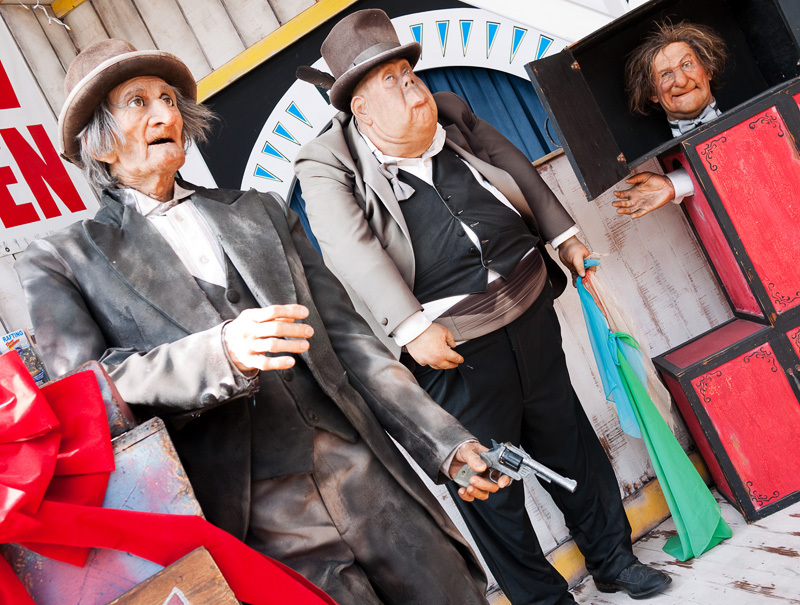 And tomorrow … who knows? If you have time, come on over the Morning Mist Village along the historic Arts and Crafts Trail on Glades Rd just outside Gatlinburg. 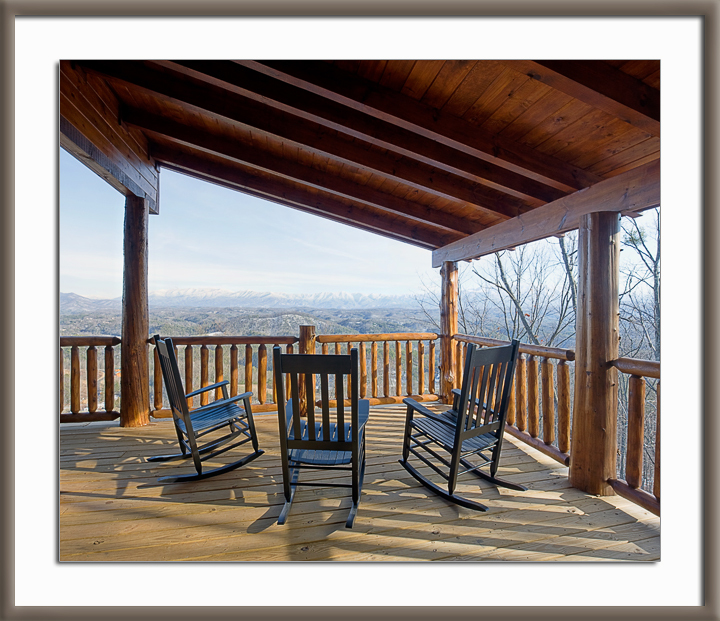 At the William Britten Gallery you might find a Smoky Mtns photo to remember your vacation. It’s a lazy summer Monday in June. Nothing much to do but park yourself out on the deck chairs, contemplate the Smoky Mtn fabulous view and start the day out slowly. 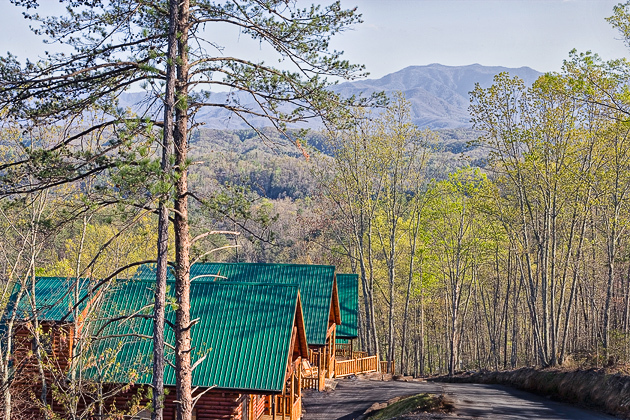 One of the magical things about the Smoky Mtn area around Gatlinburg is that although there are hundreds of cabins with a view of the Smokies, most of them have a view that makes you feel like you are the only one there. Total blissful solitude. 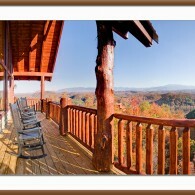 This cabin offers a great panorama of Mt. 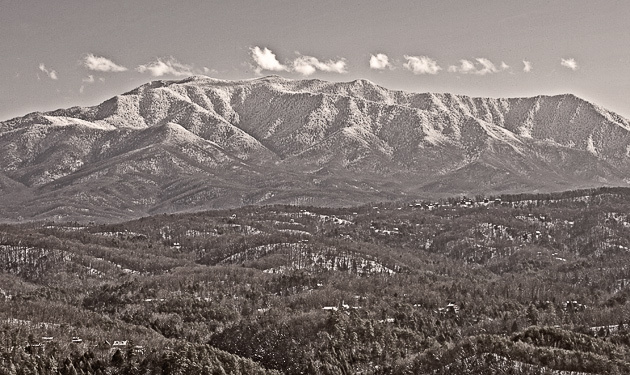 LeConte from just a few miles away. If you’re here on a vacation or quick getaway, please consider a visit to the William Britten Gallery in Gatlinburg, TN. 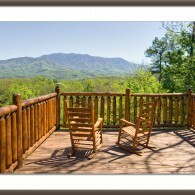 You might find a photo memory to take home among my display of Smoky Mtn images. Happy Friday! It’s been a while since we had a Philosophical Friday. 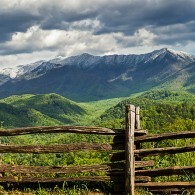 Today’s thoughts are about living in an area like Gatlinburg that features great changes in altitude. Downtown Gatlinburg is about 1500 feet above sea level, yet only about 20 miles away, on the top of Clingman’s Dome, the altitude has climbed to 6,643 feet! That’s over a mile higher! So, what’s philosophical about that? Well, as in the photo above, it can be a delightful spring day in early May down at 1500 feet, but after a 20 minute drive you could be making a snowman! It’s almost like being able to move around in time, just a little. Or it’s like adding another dimension to life. In most geographical areas the climate is determined by the two factors: the time of year and the latitude. But when you add that third factor, altitude, the possibilities are expanded. 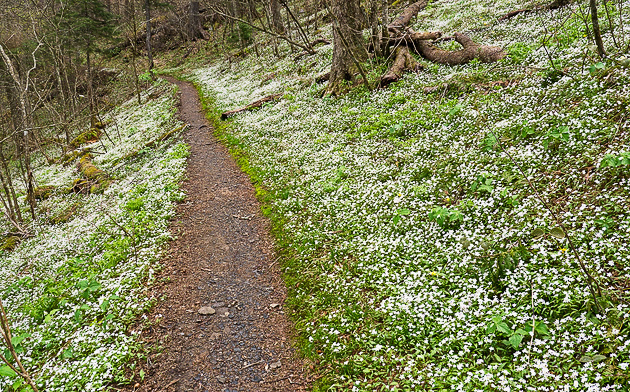 For example, the photo below shows the wildflower Spring Beauty crowding the Appalachian Trail near Newfound Gap. The photo was taken this week, in late April. But we enjoyed Spring Beauty on some of the favorite wildflower trails over a month ago! 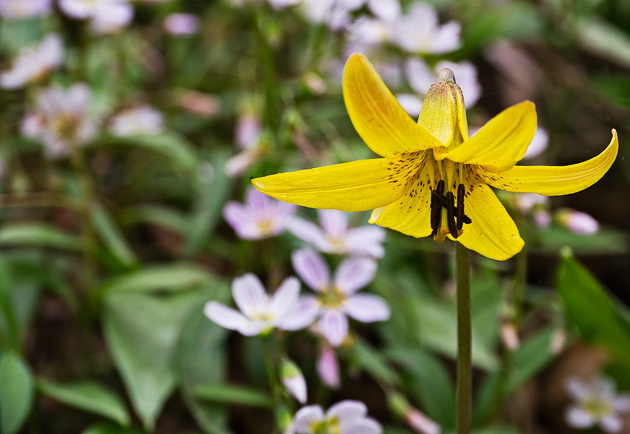 The Trout Lily below is another example of the changes in altitude. I missed Trout Lily when it bloomed weeks ago, but by hiking the mile-higher Appalachian Trail this week I was able to turn back the clock and get a photo! 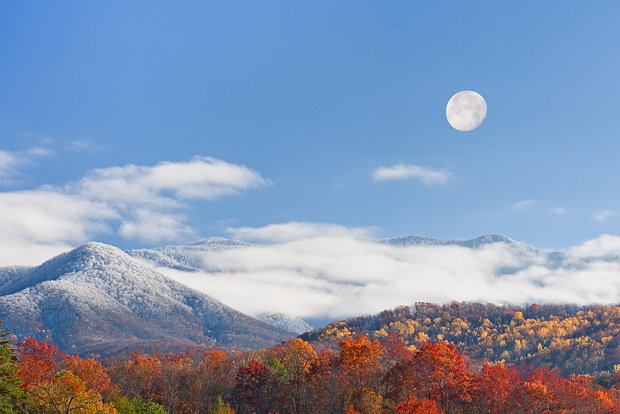 And of course the whole thing works in reverse during the fall, when we can rise up into winter before the season would normally start, as shown in my photo of the Smoky Mountains Moonrise. 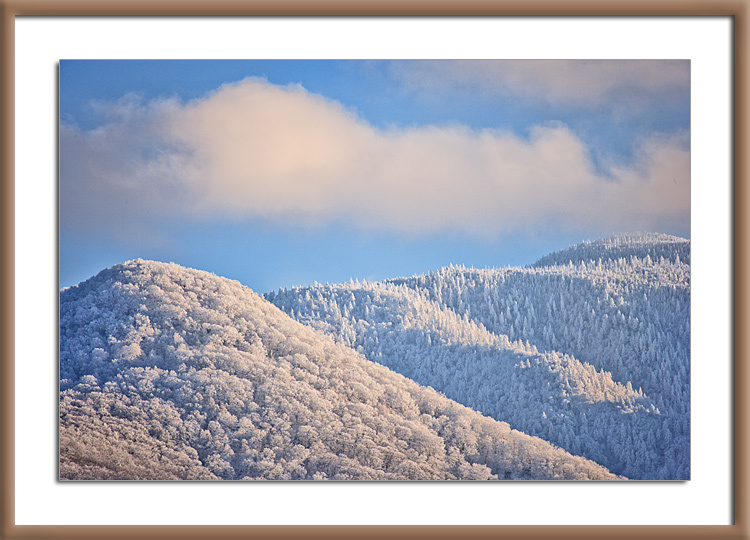 Thanks for listening to my ramblings, and as always, please stop in at the William Britten Gallery in Gatlinburg to see my complete collection of Smoky Mountains photos. 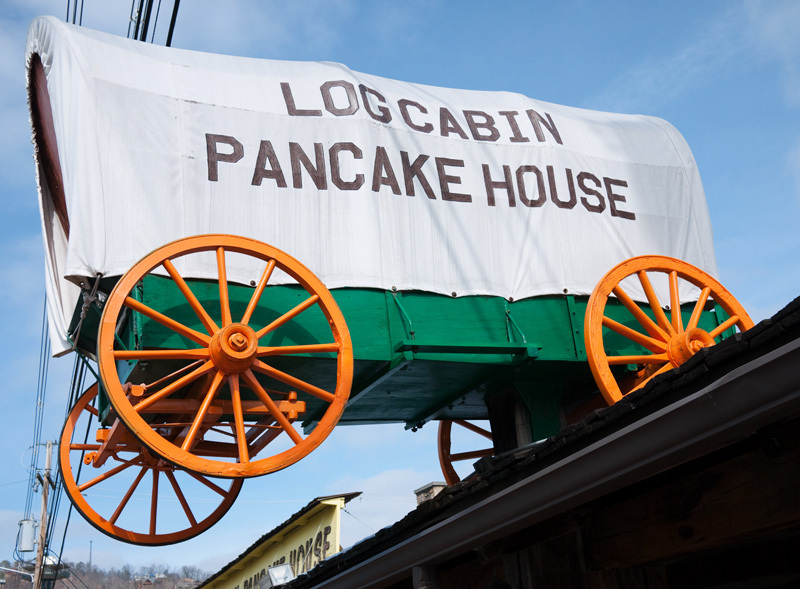 In the late 1920s Gatlinburg entrepreneur Jack Huff built a 20 by 24 foot cabin out of balsam logs that was the forerunner of today’s LeConte Lodge. The roof was tarpaper, with a floor of native clay. 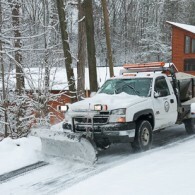 For more than 35 years Jack and his wife Pauline operated Mt. 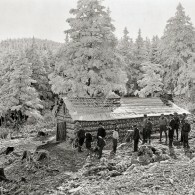 LeConte Lodge. Jack was the son of Andrew Jackson (Andy) Huff, who kicked off Gatlinburg tourism when he built the Mountain View Hotel in 1916. The photos above and below were taken by Knoxville photographer, Jim Thompson. Thompson can be seen standing at the rear of the cabin in the photo below. 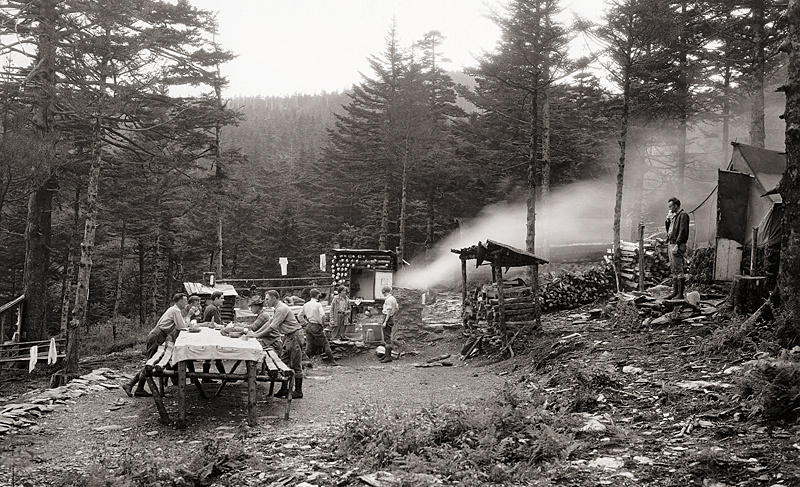 Also in both of these photos is another early Smoky Mountain photographer, Dutch Roth. 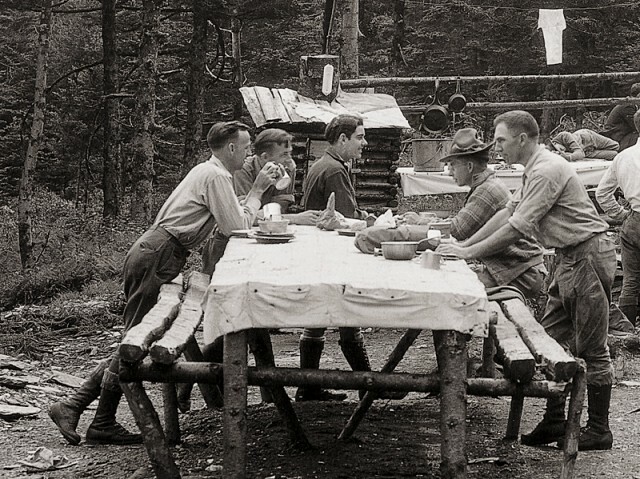 In the picture above, Dutch is the one sitting on the stump, holding his tripod. Below, he’s in a lower bunk, third from the right. Click on any of these photos to see a larger version. 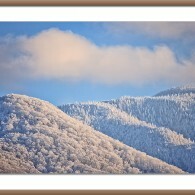 A free winter wallpaper/screensaver in appreciation for all my blog and facebook fans. This is Bull Head on the right and Balsam Point on Mt. 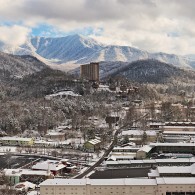 LeConte on the left, in January 2011, taken from the observation deck of the Space Needle in downtown Gatlinburg. This image, and all other wallpapers, can be downloaded from http://williambritten.com/wallpaper/ Just click on the file name “snowkies2.jpg” and then once the large image has come up in your browser, right-click on it to save it to your hard drive. Then follow instructions below. For Windows users, just save the file to any location, then Open Desktop Background by clicking the Start button , clicking Control Panel, clicking Appearance and Personalization, clicking Personalization, and then clicking Desktop Background. Then click the Picture location down arrow and click Browse to search for the picture on your computer. When you find the picture you want, double-click it. It will become your desktop background and appear in the list of desktop backgrounds. Finally, under How should the picture be positioned, choose to have the picture fit the screen, and then click OK.
On the Mac, save the image to your Pictures folder, or any other location. Open System Preferences icon on your dock, and select Desktop & Screensaver. 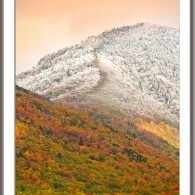 Select the picture, and then select Fill Screen, or Stretch to Fill Screen. Watch for more free wallpaper images in the weeks to come! 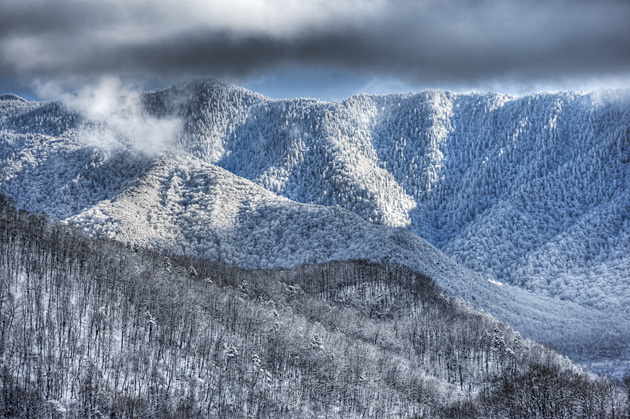 And please stop in and visit me to see the complete display of Smoky Mountain Photography at the William Britten Gallery in Gatlinburg, TN, near the Great Smoky Mountains National Park. The picture above is Mt. LeConte and the Smoky Mountains looming over downtown Gatlinburg. Taken from the observation deck of the Space Needle two weeks ago after our big Christmas snowstorm. 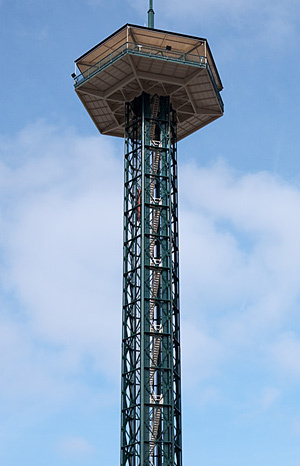 The Space Needle offers a great vantage point to view the Smokies up close and also get a panoramic view of Gatlinburg and the surrounding mountains. You can click on the black and white image below to see a larger version. As always, the welcome mat is out at the William Britten Gallery in Gatlinburg, TN. 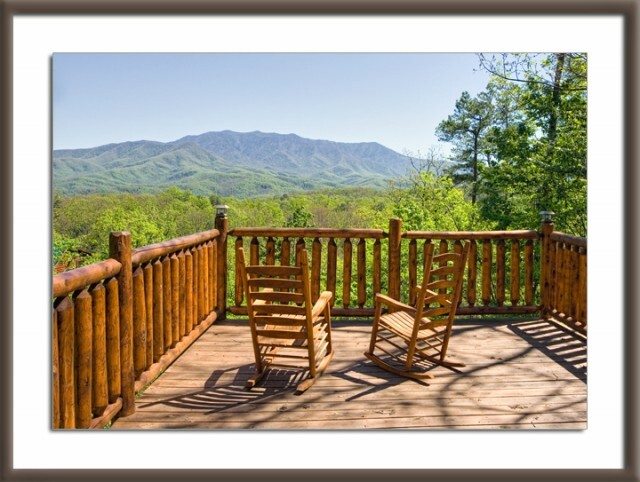 Please stop in for a visit and browse my complete collection of Smoky Mountain Photography. 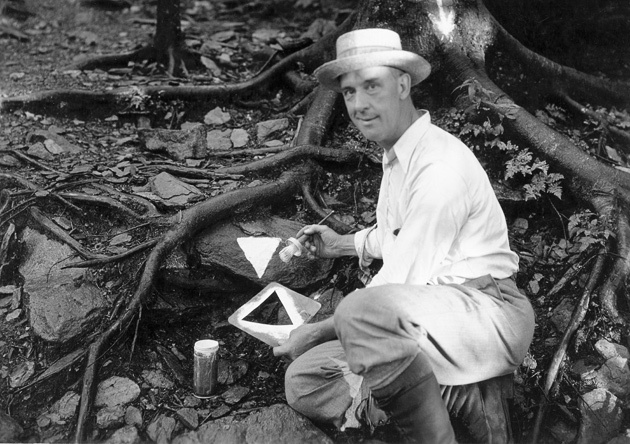 Jim Thompson was a founding member of the Smoky Mountains Hiking Club and a prominent Knoxville photographer during the 1920s to 1940s. 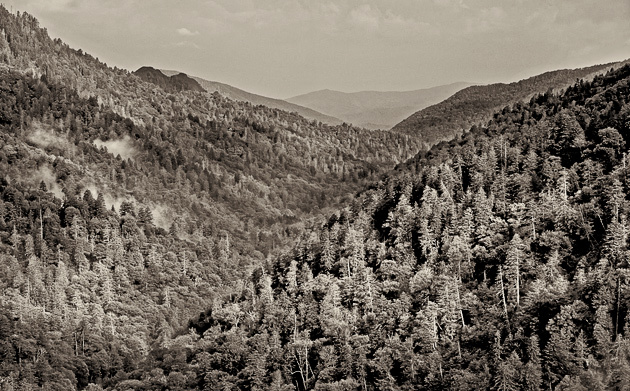 Along with his friend and fellow hiker, Dutch Roth, Thompson created a large body of images from the early days of the Great Smoky Mountains National Park. 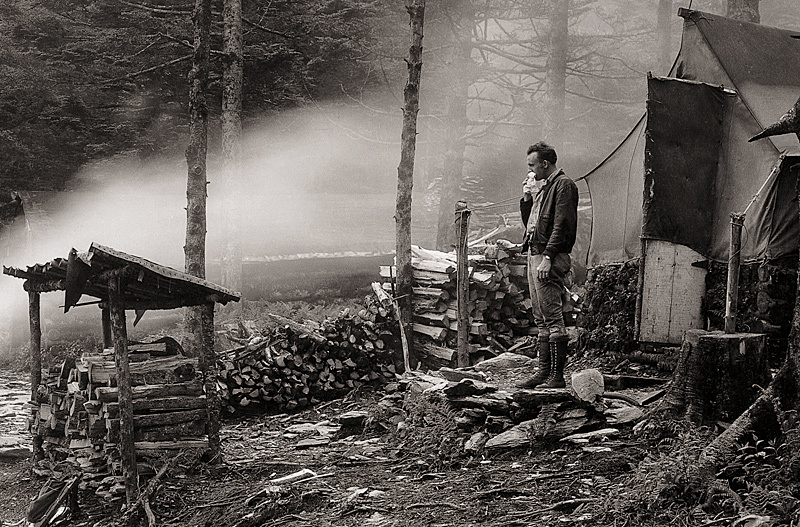 I will be posting images from both of these early Smokies photographers from time to time. As a member of the Knoxville business community that was supporting and promoting the formation of a National Park in the Great Smoky Mountains, Jim Thompson appeared with many of the dignitaries that were instrumental in the final creation of the Park as we know it today. If you take a look at the photograph on this posting about Dutch Roth, you will notice that the two pictures are very similar. It looks like the two friends were hamming it up just a bit! The picture below was taken during a Smoky Mountains Hiking Club outing to the primitive lodge on the top of Mt. LeConte. 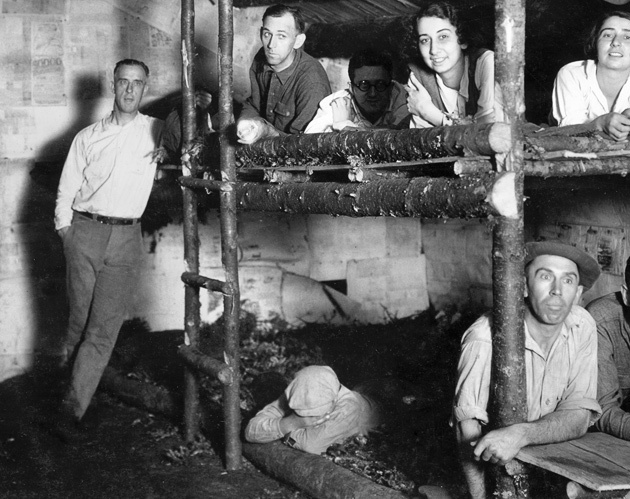 Jim Thompson is standing at the left of the picture, and Dutch Roth is lying in a bunk to the right. 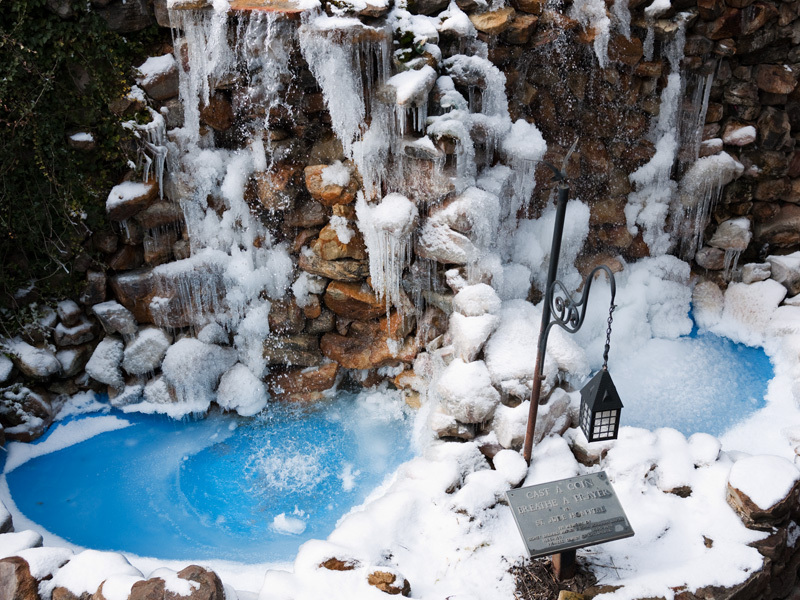 It has been frigid cold here in Gatlinburg! 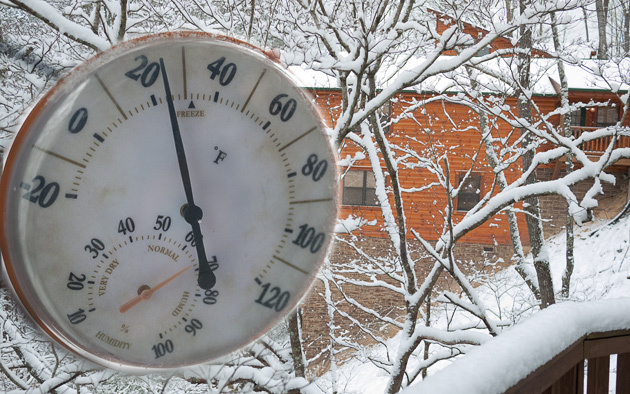 Temperatures in the teens for several days. 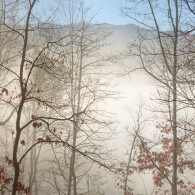 The morning light has a watery winter translucent quality. Our little cabin stares into the face of a stern and slumbering Mt. LeConte. But it’s also a warm time of year. A fire in the stove, bread in the oven, a cat on the lap, tea in the cup. If you’re in the area, stop in and visit me at the William Britten Gallery in Morning Mist Village on Glades Rd. in Gatlinburg. No need to purchase anything … stop in and I’ll give you a cup of coffee or tea! 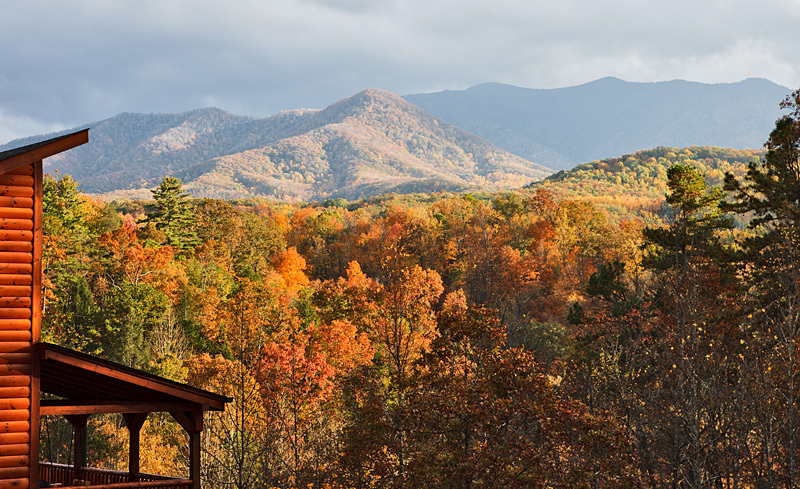 The Smoky Mountain autumn was a good one this year. At lower elevations some pockets of leaves are hanging on, but as you can see in the photo above, the forest is bare on Mt. LeConte. 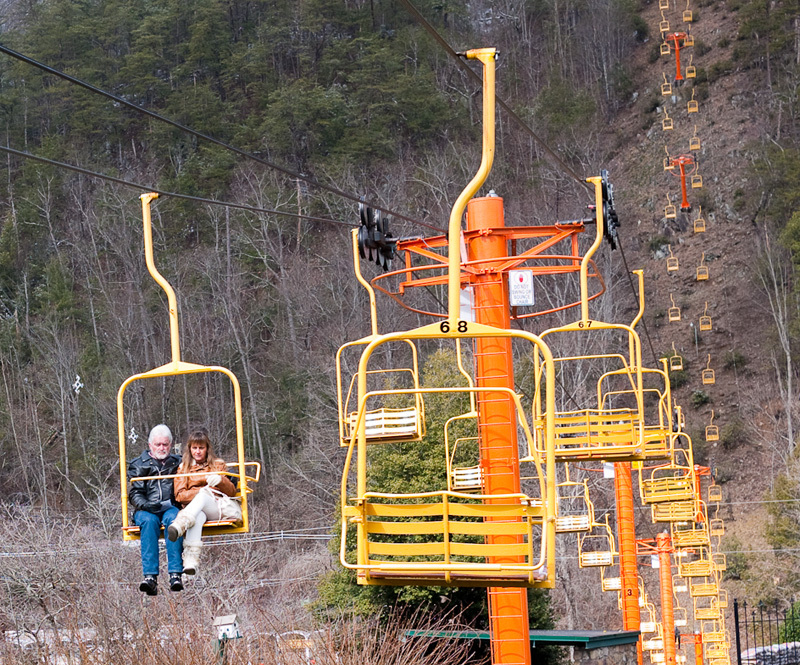 For some, this is a favorite time to get away to the Smokies. The October crowds are gone, but the days still hold a warmth and a glow. The days tend to drift by in blue-sky splendor this time of year. All the way to Thanksgiving before winter stakes its claim. 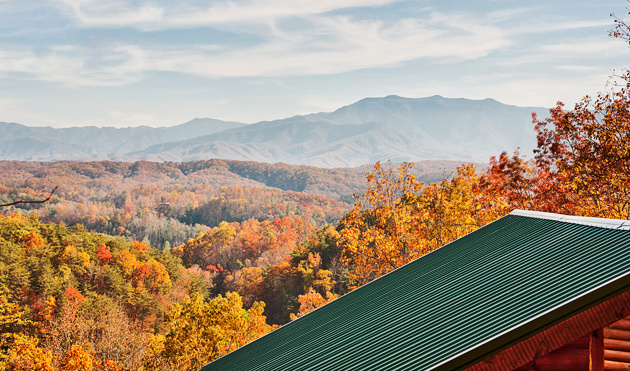 If you’re in the area, please stop in and visit me to see the complete display of Smoky Mountain Photography at the William Britten Gallery in Gatlinburg, TN. Today’s Miles Away is the view I see every day, and a view that has appeared in this blog many times, in many variations, in all the seasons. October is over. 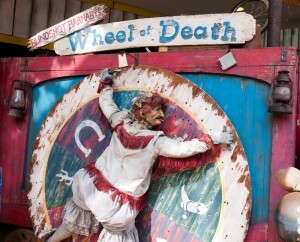 The season is winding down. Still need to get over to Cosby for a few bushels of apples and make sauce for our winter fruit. Still one more craft fair downtown before the winter hibernation can begin. But today, I would love to be miles away for just a little break. Transport me back to Maine for one more lobster roll! 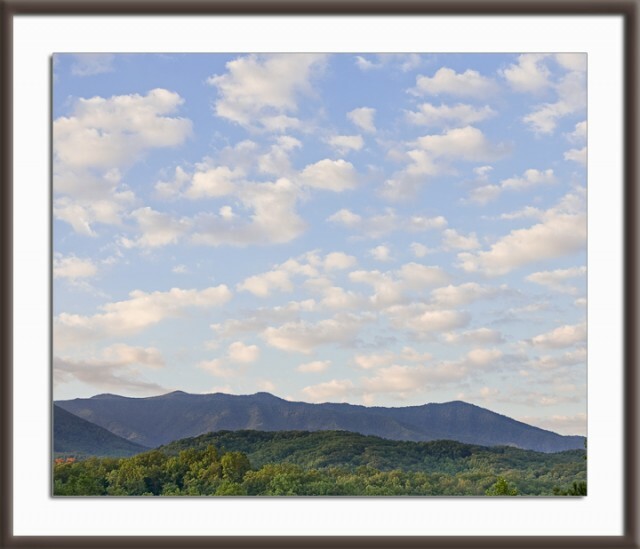 Well, in the meantime, please stop in and visit me to see the complete display of Smoky Mountain Photography at the William Britten Gallery in Gatlinburg, TN. 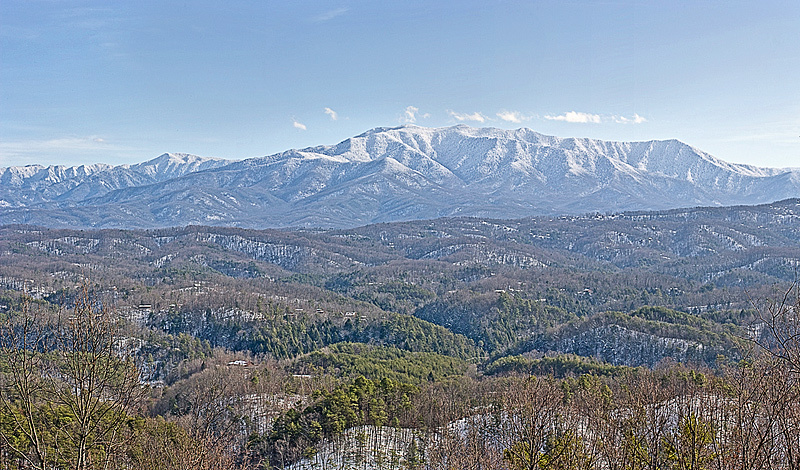 Usually by the end of February, winter is losing its grip in our quiet little village on the edge of the Smoky Mountains. 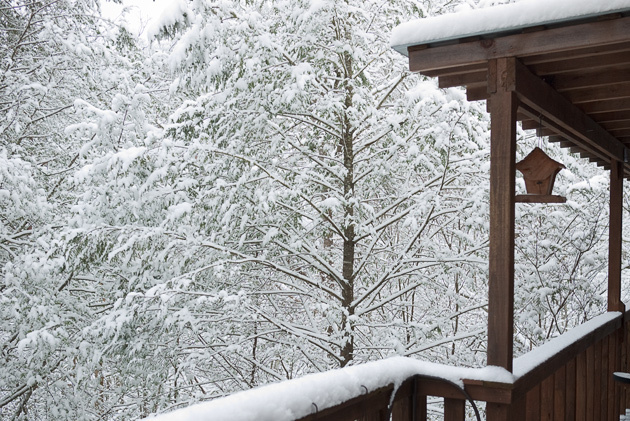 But this year we’ve still got the twice-weekly snowstorms, still wearing the triple layers, still the hot chocolate and tea, the howling wind at night, the cats that refuse to venture outdoors … you get the picture. In fact, we seem to be stranded in the Olympic Alternate Universe, staying up till midnight watching triple toe loops, Salchows, axels, and Lutz’s. 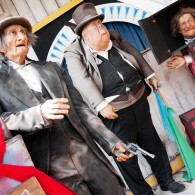 As I write this post, I’ve escaped the cabin fever for the confines of my gallery for the day. 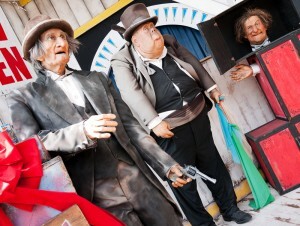 The tourists are creeping back into the scene … many looking to escape the northern snows … ha! Still the snowcap on Mt. LeConte, still the cabin fever. So head downtown for a walk-around. 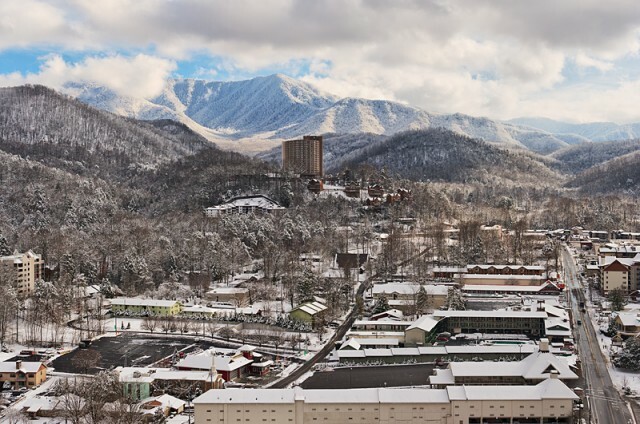 Gatlinburg on a winter weekday can be slow, with few tourists on the Parkway promenade. The wishing well is frozen, and hardly a brave soul on the chair lift. The ticky-tack gaudiness of the Parkway is on stark display, without the swells of walkers and gawkers to soften it. 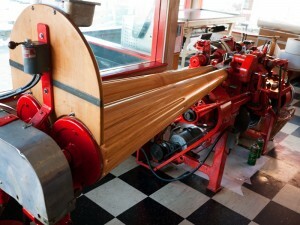 Even the taffy-making machine sits idle, and the pancakes wait. It’s a quiet time in a resort town. A time to walk around and take it in slowly, really look at it. 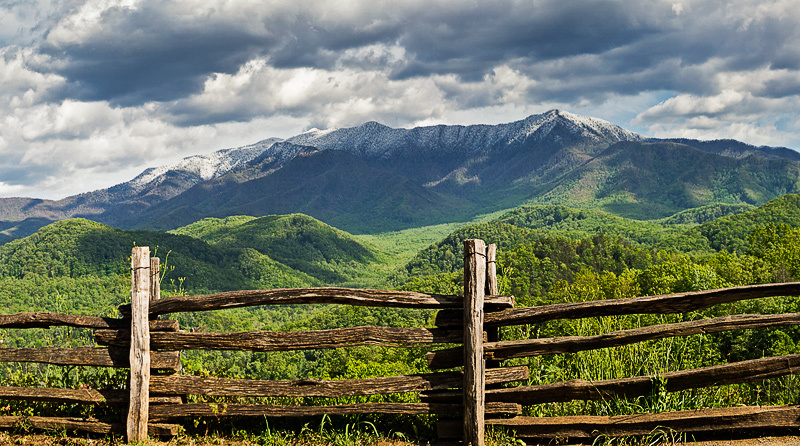 Just a few blocks south is the boundary of the Great Smoky Mountains National Park, and if you need a refuge, there it is, all year round.